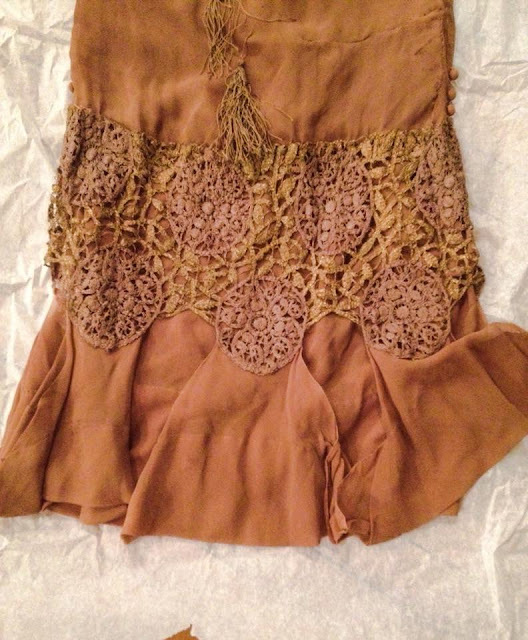 Clare Hamel’s 1925 flapper-style wedding ensemble, included dress, hat, shoes and underslip, all of which have survived and are in the collection of the Newmarket Historical Society. 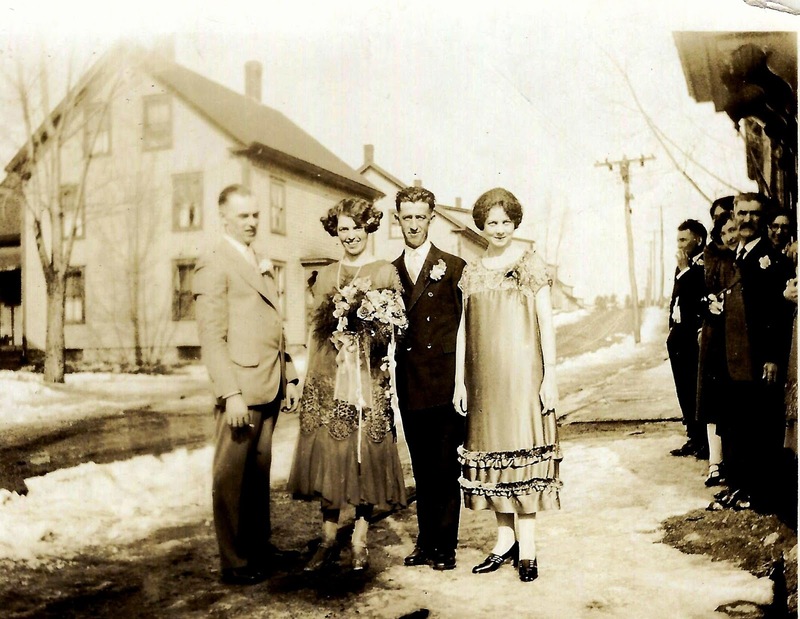 The photograph shows the wedding party on Nichols Street, Newmarket, NH, with the smiling bride in her ensemble, holding an elaborate bouquet. 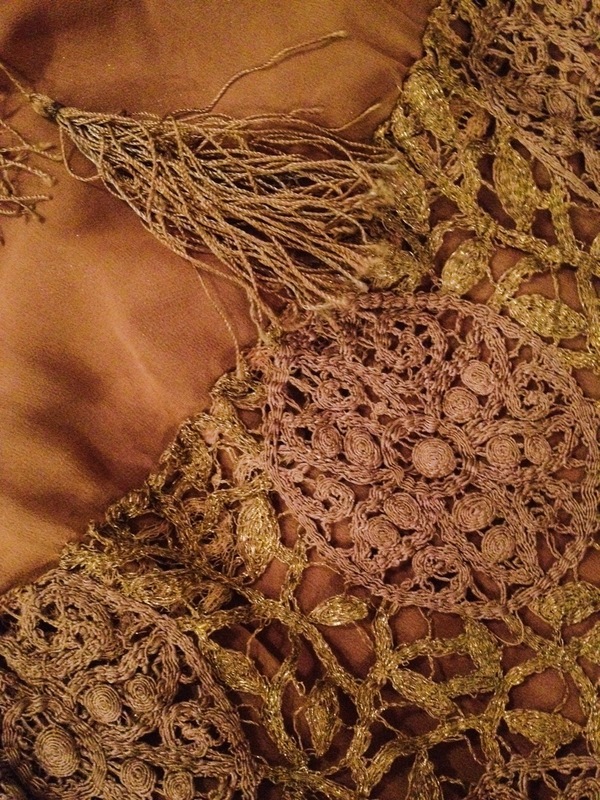 The tawny bronze silk dress is ornamented with gold-tone trims. The contrasting yellow cotton slip was worn beneath and must have created quite an effect, though hard to visualize today. The bride-to-be clearly selected the items for her ensemble with care and of the latest fashion. Clare married Pierre Hamel at St. Mary Church, in Newmarket, New Hampshire on February 16th, 1925. For more information on the collection, contact the www.newmarketnhhistoricalsociety.org. The Los Angeles County Museum of Art (LACMA) has several pairs of superb E.J. Costa and Sons shoes in its rich collections. Dating from the 1910s-1920s, each pair combines some of the best features of this snazzy, creative era of shoe design while reinterpreting the Georgian style. The shoemakers were located in Paris, and as noted by Elizabeth Otis Williams in her 1907 “Sojourning Shopping and Studying in Paris: A Handbook Particularly for Women,” Costa and Sons were patronized by royalty 'and priced accordingly' with ‘good shoes made to order.’ They were in excellent company-- Williams only mentions Hellstern at the place Vendome, and Perchellet as quality shoemakers at that time. 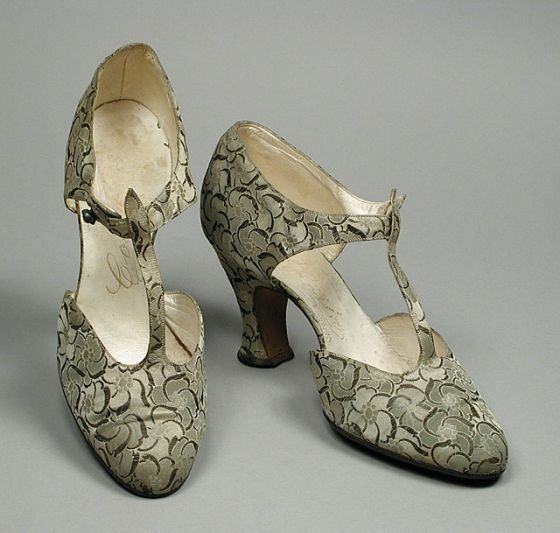 This pair of c. 1918 silk brocade women’s pumps (above) features a pleasing pattern, high elegant Louis heel and pointed toe, styling them a delightful pair of Georgian Revival shoes. 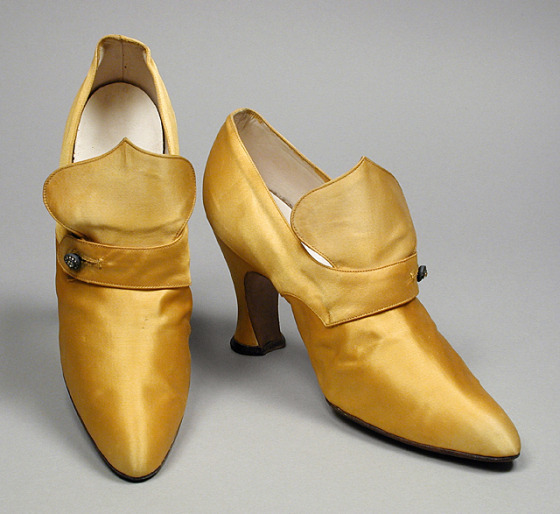 Also from the late 1910s, these arresting yellow-gold, silk satin pumps would have captured looks on the street, theater or dance floor. And, a third pair of Costa & Sons shoes – T-strap sandals from the 1920s. 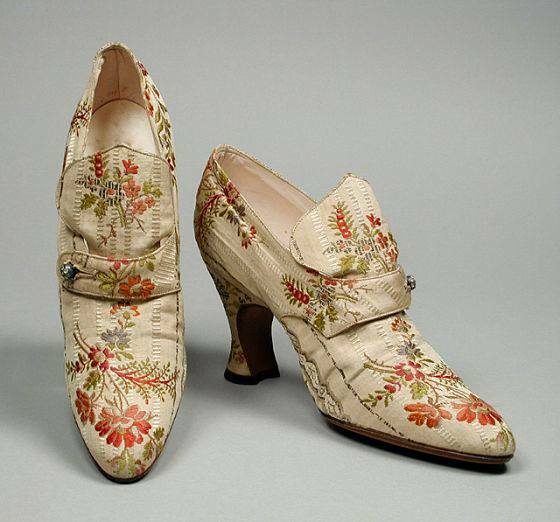 The uppers are of silk brocade. All three pairs make use of luxurious materials, brocaded silk, silk and silk satin, as well asa revived French of Louis heel, further reinforcing the inspiration of history in the design and style of footwear of the era. 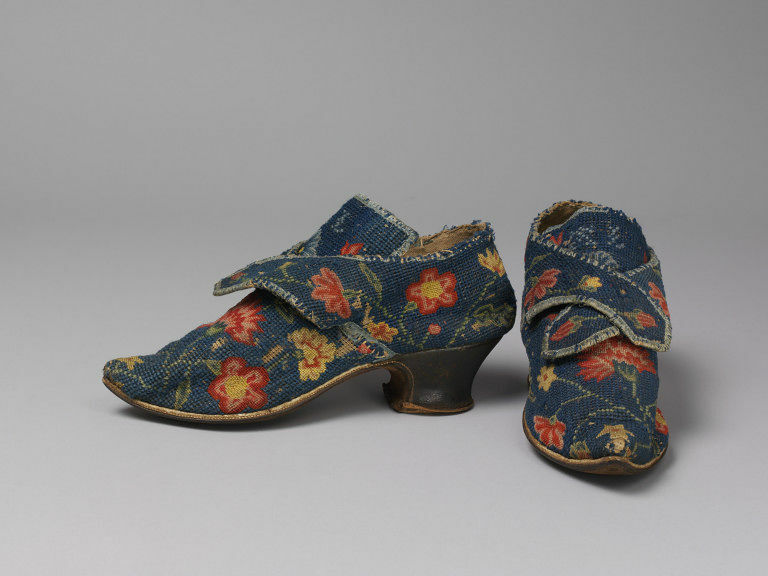 I have long been enamored of these cheerful, chipper shoes, housed in the collection of the Victoria and Albert Museum. They are visually pleasing with a balanced design. These linen canvas shoes are embroidered with colored wools in cross stitch and tent stitch, and feature a short heel and latchets (or straps) for buckles to fasten them. From Great Britain, c. 1730s-40s; the wearer and maker are unknown. As I prepare to curate an exhibit at www.MassHist.org in 2018, I have been thinking a good deal about photography and presentation of costume over time. I find both the V&A and the Metropolitan Museum good sites for such exploration as they have been documenting their collections over an extended period of time. I will be returning to this theme over the next 18 months, but thought you might enjoy considering your response to these two photographs of the same shoes. Does the photographic style change or influence your response? Do you have a preference between an artistically photographed vision and the more documentary style? 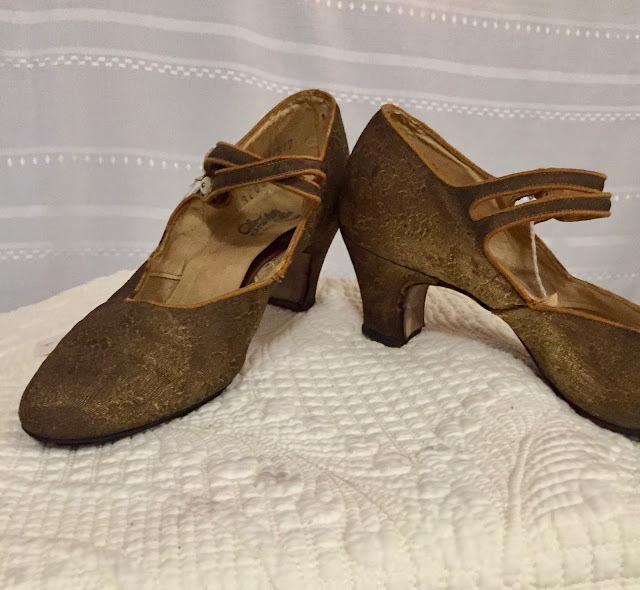 Note the wear apparent at the heel and the toe; the turned up, pointed toe; the white rand, and the straps for buckles are much more visible in the second photo. 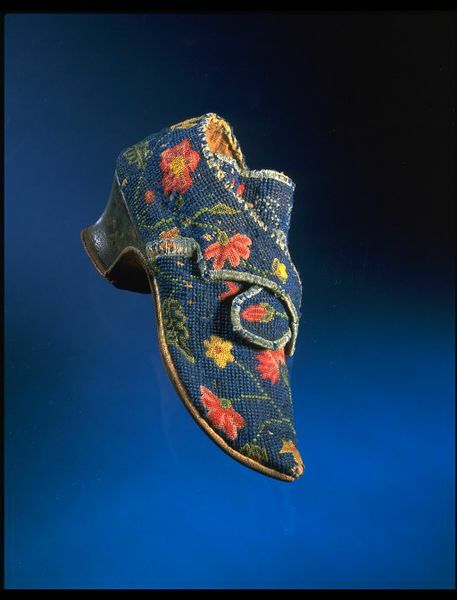 There is drama associated with the single shoe which appears suspended in a beautiful blue backdrop, and with its saturated color, may appeal to contemporary audiences. Both images convey different features and qualities – some which may appeal more to one audience over another. Taken together, the differing photos provide a fuller portrait. Sumptuous fabrics, vibrant colors and textures, masses of elaborate trims - all are defining elements of fashionable Victorian women's clothing. Nineteenth-century designers had very definite ideas of what constituted beauty, and these concepts had a widespread impact on art and design. Embellishments in Victorian Fashion focuses on how nineteenth-century aesthetics influenced women's clothing design and construction. A variety of Victorian design concepts are examined in detail, including self-trim, color and texture contrasts, ruching, pleating, ribbon work, and asymmetry. The exhibition features fifty garments from five institutions in Maine and New Hampshire: the Saco Museum, the Irma Bowen Textile Collection of the University of New Hampshire, the Portsmouth Historical Society, Strawbery Banke Museum, and the Woodman Institute of Dover, New Hampshire. Astrida Schaeffer has been making reproduction historical clothing since 1986 and museum mannequins since 1998. Her recent book, Embellishments: Constructing Victorian Detail, focused on the UNH Irma Bowen collection and has received high praise. Astrida holds a Master of Arts in History from the University of New Hampshire with a focus on material culture and museum studies, and was assistant director at the UNH Museum of Art for ten years, where she was responsible for collections care, exhibition installation, and object preparation. 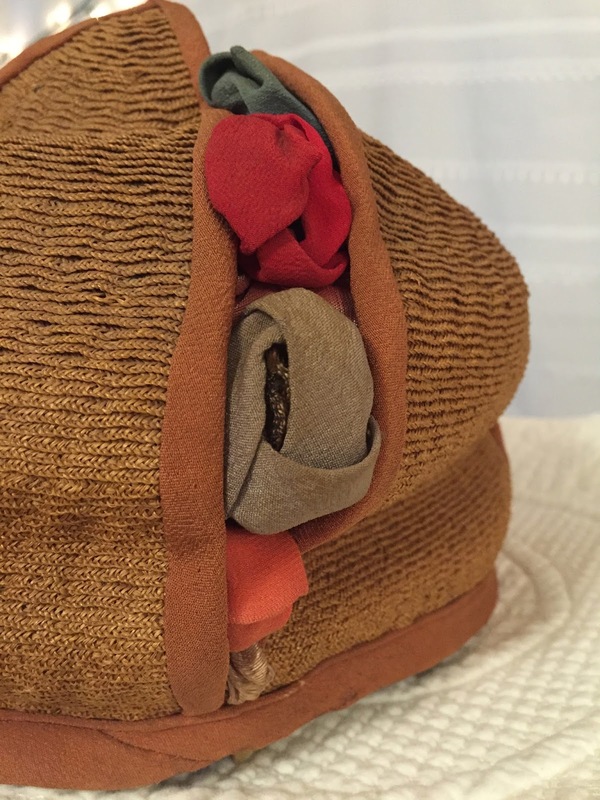 She trained in mannequin production at the Textile Conservation Center in Lowell, MA and with the Northern States Conservation Center. 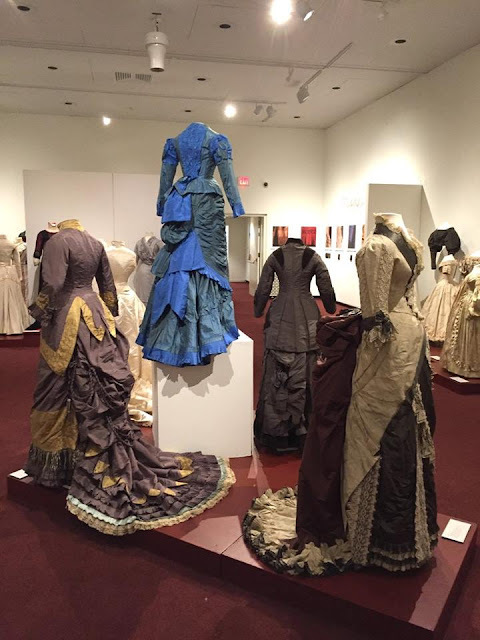 Friday, August 18, 6:00 p.m.
How Victorians Got So Fancy will be the final program in our Embellishments in Victorian Fashion summer exhibit. 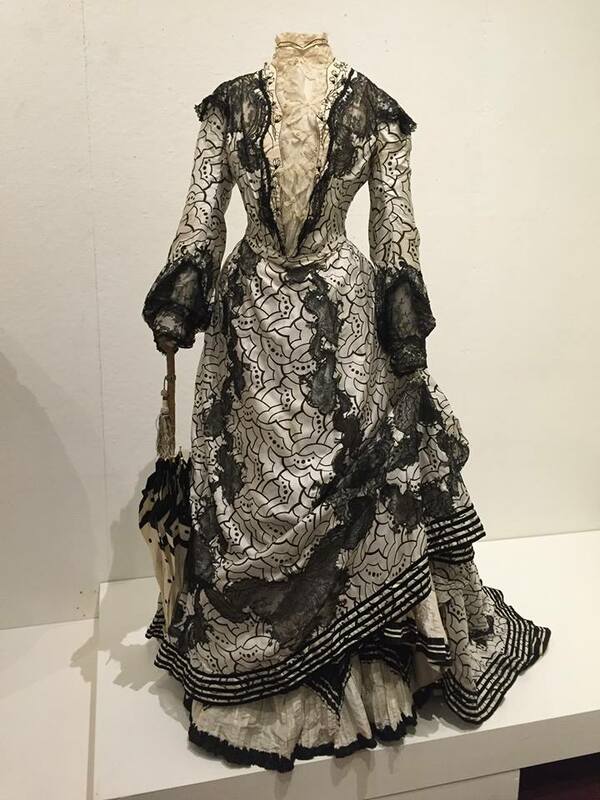 In this program, guest curator Astrida Schaeffer will focus on the silvery grey 1870s day dress made and owned by Celestia Freeman of Somersworth, New Hampshire. Freeman was the wife of a mill overseer who likely saw this dress as a way of marking her status in the new community she moved to with her husband. 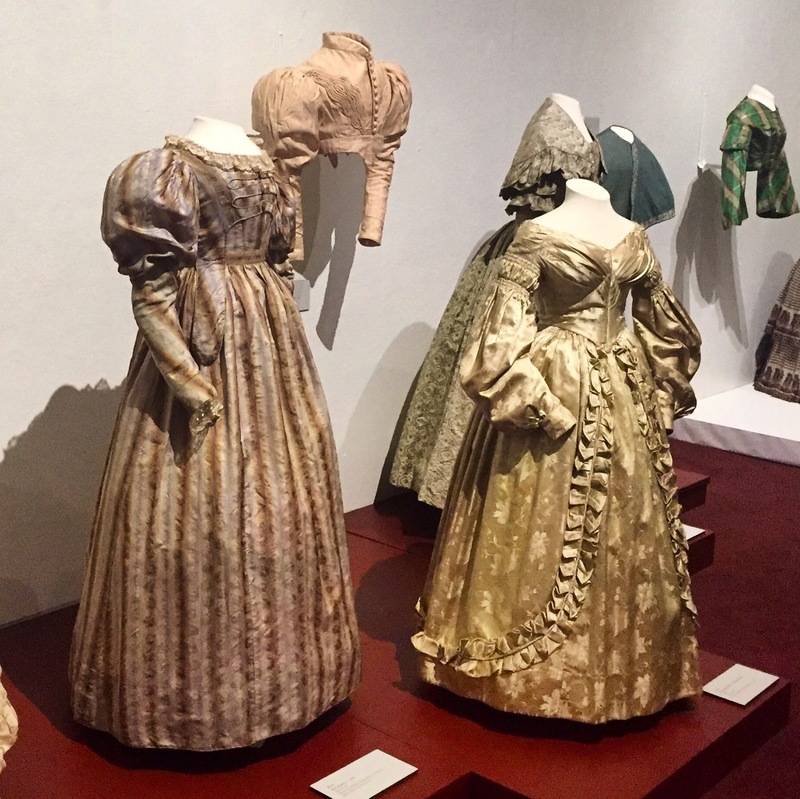 Schaeffer will use Freeman's well preserved dress to explore the development of the sewing machine, the importance of pre-made patterns, and the effects of the fashion magazine industry.